The sun had just begun to set as I took the elevator up to the third floor of the Michigan Building where the “salon” would take place. Light poured through the giant windows, and although crumbling and nowhere near as beautiful as they used to be, the iconic architectural details of the old Michigan Theatre seemed to come back to life as guests mingled around the avant-garde art exhibit that appeared to be floating in midair between the arches. Constructed in 1925 during the Renaissance Revival, the portion of the building where dinner was held is now primarily used as a parking deck. 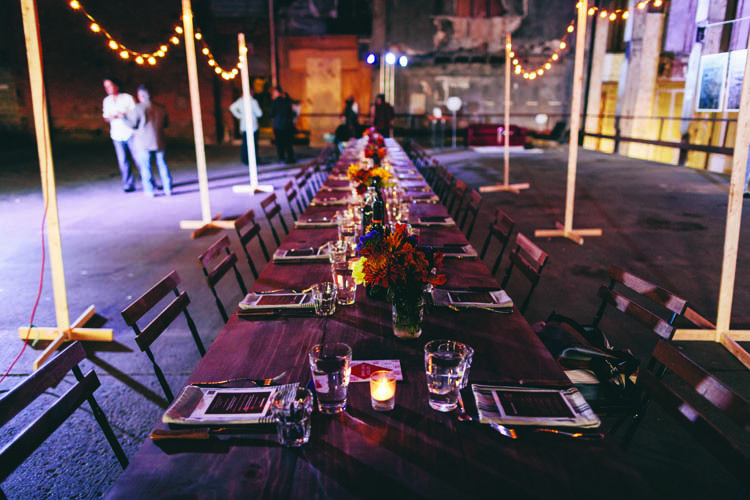 But in late September during the same week as the Detroit Design Festival, two companies, Salonnière and Stockyard Detroit, held a pop-up dinner, or “salon,” there unlike any other. 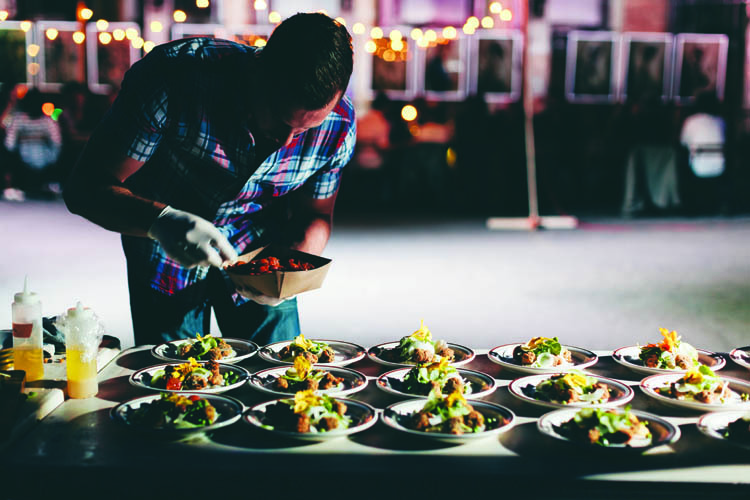 Chances are you’re familiar with the pop-up dinner concept, one of the many ways Detroit’s food scene has recently blossomed. These dinners are usually tasting menus planned by local chefs, some with their own brick-and-mortar joints who want to try something a little different, but more commonly hosted by up-and-coming chefs and restaurateurs with big dreams, like Stockyard. In less than two years, Bogoff and his partner Michael Ivkov have quickly built a mobile brand for themselves. Starting with pop-up dinners and a vagabond “supper club,” the two now have a food truck that rotates locations weekly. They credit social media, especially Instagram, as playing a large role in helping them attract companies like Shinola, and now Salonnière, Bogoff says. “The pop-ups will come to an end eventually, but I love them right now, it’s what we do, it’s the beginning of a life of other things too,” Bogoff says. The food scene in Detroit is evolving faster than The New York Times can keep up, Bogoff jokes. “When you end up having a food town that generates some movement then people will come, and that’s cool [but] I still love the people that are in it now during this awkward, weird transition into a more refined food town phase,” Bogoff says. “Salons have acted historically as intellectual, political, and artistic launching pads for emerging artists and thinkers,” she says. “Most commonly associated with the French literary and philosophical movements of the 17th and 18th centuries, salons were equally influential in Latin America and the Arab world,” she says. Salonnière seeks to revive this tradition in modern, nomadic urban settings as a complement to the conventional art gallery. While traveling extensively to places like Libya during the Gaddafi period; South Africa, just after apartheid; and Tunisia on the cusp of the Arab uprisings, she hosted her own salons and realized there was a niche of young people like her — ones who were interested in art, but desired something beyond the traditional art gallery experience. “My vision is to build a community of next generation art collectors,” she says. Egan was drawn to Stockyard for their experience with pop-up dinners in unconventional settings. The two companies’ first event sold out both nights. 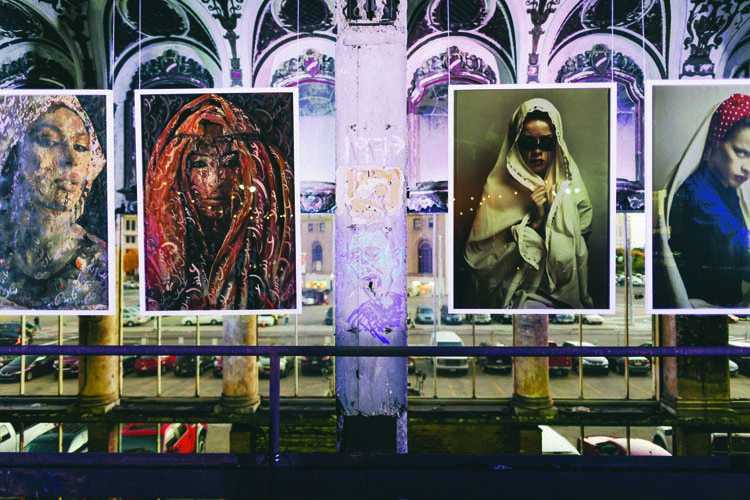 The abstract artworks by Algerian fashion photographer Mizo, along with good music and mood lighting, laid the groundwork for possibly the most memorable night I’ve ever had in Detroit. As guests drank wine and got to know each other around the large 30-person dining table surrounded by strands of outdoor lights, Mizo discussed his work while Stockyard served artfully plated dishes. 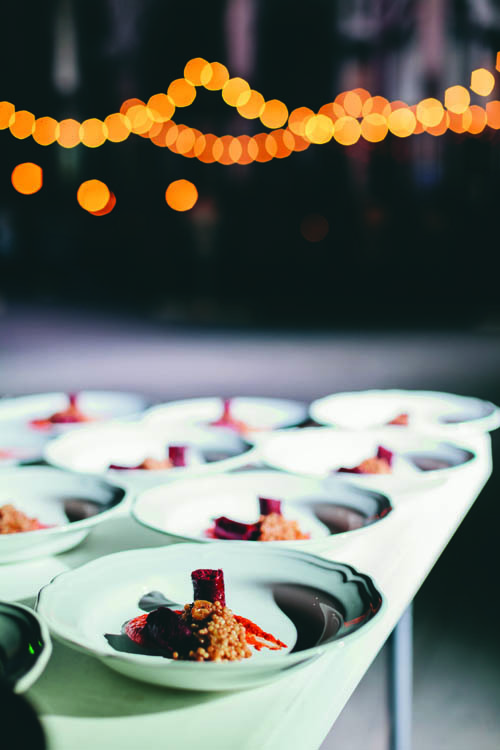 Highlights of the five-course meal were lamb sausage with couscous, romesco sauce, rainbow beets, and pistachios, along with the evening’s dessert of earl gray panna cotta with blueberry-lavender jam. You can catch Salonnière and Stockyard together again next month at The Carr Center. Last month Stockyard hosted a dinner at the Piquette plant, and Egan hopes to one day hold a salon at the Michigan Central Station. 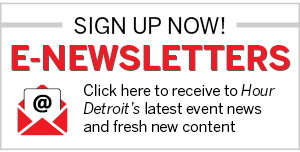 For the latest on where the next salon, pop-up dinner, or food truck stop will be, visit salonniere.co or detroitstockyard.com.